Gault extends goal streak Rookie Corey Gault has re-produced his impressive intra-club form as he kicked three goals in the second half against Geelong. Corey Gault will return home to Western Australia after five years as a Collingwood player. Photo: AFL Images. Collingwood farewells forward Corey Gault who has announced his retirement from AFL football. The 24-year-old will return home to Western Australia after five years at the Pies during which he played six senior games and kicked two goals. Selected with pick 65 in the 2011 national draft, Gault made his debut in the final round of the 2014 season, however injuries forced him to spend lengthy stints away from the field. 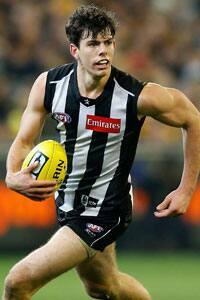 Collingwood GM List Management Derek Hine thanked Gault for his professionalism and commitment to the program. “Corey is an upstanding young man who persisted through injuries and setbacks to earn his opportunities at senior level,” Hine said. Gault’s retirement comes as Collingwood submitted its playing list to the AFL ahead of Monday’s first list lodgement deadline.